Executive Coach, Jacqui Harper, finds out. It was always going to be a tough call to follow Amy’s 2012 TED Talk: it’s had over 30 million views. Why? A lot of it is to do with the Harvard Business professor herself. When she tearfully discloses her own struggles with not feeling worthy it takes the conversation out of an academic comfort zone and into real-world pain and emotion. Viewers in their millions have connected to her as she shares strategies for becoming bold and confident: the power poses. The new book on ‘Presence’ starts with a lot of anecdotes including one about Amy having brain freeze in an elevator with three academics she wanted to impress. I wondered if the book was going to be overloaded with stories from the many people who have written to her and become a rather tedious read. In this judgement I was probably a little premature as the book quickly moves into a thoughtful and wide- ranging discussion on what presence is. She gives the best definition of presence close to the end of the book when she says it’s “when we execute with comfortable confidence and synchrony, regardless of the outcome”. Synchrony, she explains, is all about the alignment of emotions, thoughts, physical and facial expression, behaviours”. She illustrates presence in surprising ways. There’s an actor’s perspective which is well-articulated by Oscar winner Julianne Moore and ultimately about feeling powerful. We also hear from a Boston priest whose presence has drastically reduced serious gang crime. His power came from his authentic presence. But perhaps the most powerful presence in the book is that of Cuddy. It closely matches my recollection of meeting her in person at Santa Barbara airport in 2014. As she kindly helped me with my suitcases I was closely observing her and she came across as a warm, smart, energetic and genuine person. She is also humble and there’s the merest hint of vulnerability. Her authorial presence is strong and dynamic. Her style ranges back and forth from highly academic to practical self-help. The rigorous research is clear from the extensive list of references and sources spanning thirty one pages. Self-help pointers occur throughout and dominate the later chapters of the book. In her quest to argue the science of presence she largely succeeds. In fact it is the last few chapters that really excite me. 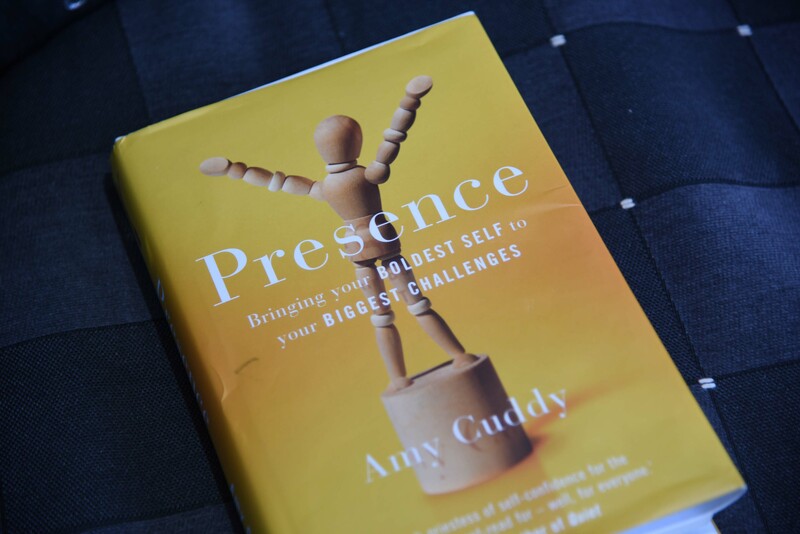 I coach executives in leadership presence and lecture on the subject at INSEAD so I wanted to know what new information Cuddy brought to the subject of presence and how this might help my coaching clients and executive students. Definitely in the ‘new’ territory is her exploration of technology and presence. She calls it iPosture. She cautions against endlessly hunching over smartphones. Her research shows that using small electronic devices makes us adopt physical positions that stifle our power and ability to be present. She also encourages us to programme our phones to remind us to check our posture every hour. I have noticed that my clients respond really well to coaching conversations in open spaces while on the go. I put it down to my clients relishing a break from air-conditioned buildings. Amy Cuddy sees it differently. She wants us to walk throughout the day and to try ‘walking meetings’ because they improve your mood and lead to better communication, engagement and problem solving. It is hard to have a conversation about presence without considering what you wear. Tucked at the end of the book are a few thoughts from Cuddy. She describes an experiment using white lab coats. Participants increased their attention spans (and ability to be present) when wearing these garments. The results were more dramatic when these same participants were told the white coats were doctors’ coats. However, when they were told the garments were painters’ coats they did not experience the same benefit. So what you wear matters and what you associate with your clothes also matters because it shapes how you interact with the present. Being mindful of what we wear is of the many small actions we can take to slowly change our future, says Cuddy. For me one of the best points she makes is about reframing anxiety. In a challenging situation instead of telling yourself to calm down she suggests harnessing the nervous energy and reframing it as excitement. I tried this going into an important meeting recently and it worked really well. Amy Cuddy’s book is a fascinating read and full of helpful ideas for those of us who want to be our best selves. And, yes, it’s a worthy successor to her TED Talk.